If you’re planning to join us at Bojangles' Coliseum, here are a few things to know. For further questions not covered here, please visit the Coliseum’s FAQ page, call the Checkers at (704) 342-4423 or contact Bojangles’ Coliseum at (704) 372-3600. The coliseum is located at 2700 E. Independence Blvd. in Charlotte. Doors will open early on Fridays (one hour and 15 minutes before game time) and Saturdays (90 minutes before game time). For all other games, doors will open one hour prior to game time. Single-game tickets start at $12 and can be purchased online via Ticketmaster or at the Coliseum box office. Box office hours on non-event days are Monday-Friday from 10 a.m. – 5 p.m. For further information on hours, please call the box office at (704) 335-3100. Tickets are required for everyone three years and older. Click here for information on accessible seating. For additional savings and benefits, season tickets, mini plans and group outings are also available. Our promotions schedule has additional details on special events for every home game. The Coliseum includes a full-service restaurant called the Red Line Club that Checkers players walk through when traveling between their locker room and the ice surface. In addition to a standing menu that can be viewed here, the club also features cocktails, draught Bud Light beer and wine. The club opens for reservations 90 minutes prior to each game. Reservations can be booked here. You must have a ticket for that night's game to reserve a table at the club. The club’s bar is open to the general public when doors open one hour prior to the game (space is limited). Catering for groups is available. For more information, call us at (704) 342-4423. The main concourse features five anchor stands with various unique offerings. One stand includes pizza and Johnsonville all-beef hotdogs, The Local Tap will offer the coliseum’s signature “Red Line Chili” as well as local craft beers, Kelly’s East Side Diner, a venue named after Charlotte hockey legend Pat Kelly, features burgers, fries and onion rings as well as Bojangles' Supremes and seasoned fries. Finally, a Bojangles’ Chicken and Biscuits location provided Cajun Chicken sandwiches, seasoned fries, Supremes and legendary Sweet Tea. Other destinations located in the concourse include Beer & Brats stands featuring Johnsonville products as well as Dippin’ Dots, cotton candy, ice cream, fresh baked Bavarian pretzels, popcorn and draught and bottled Bud Light beer. Bojangles’ Coliseum charges $8 for parking. The main lot accepts cash and credit cards as payment, while the Park Expo across the street is cash only. Season ticket holders may contact their representative to purchase a season pass at a reduced cost. Additional parking information and directions to the Coliseum can be found here. To ensure the best possible experience on game nights, we recommend leaving early and consulting mobile applications that offer real-time traffic information, such as Google Maps, when planning your trip. Please consider using Monroe Rd., Central Ave. and Wendover Rd./Eastway Dr. as alternatives to Independence Blvd., if necessary. For games on Friday and Saturday evenings, doors and concessions will open 90 minutes prior to game time. For all other games, they will open one hour prior to game time. For safety reasons, open flame grilling is not permitted in the Bojangles' Colsieum parking lot, and all permitted grilling should not be done underneath a tent. Due to limited inventory, fans will not be allowed to occupy multiple parking spaces under any circumstance. 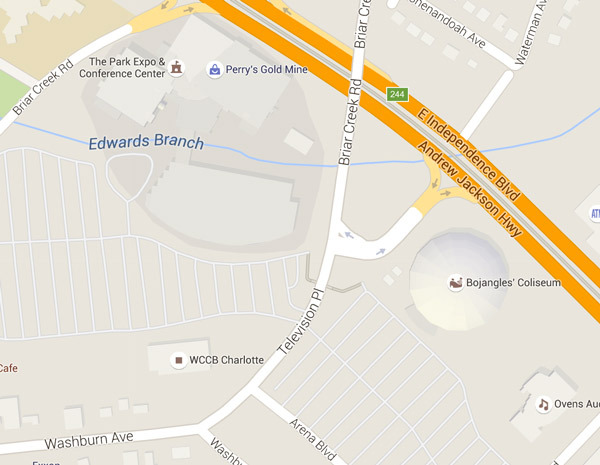 The official host hotel of the Checkers is the Courtyard by Marriott Charlotte City Center. Located at 237 South Tryon St. in uptown Charlotte, the hotel is within walking distance to several restaurants and entertainment options and only a short drive away from Bojangles’ Coliseum. Call (704) 926-5800 or visit the link above.